Although Tupac was of course foremost a solo artist, throughout his short career, he was always involved in various rap groups. It was his way to help other, young, talented rappers. An overview. While living in a housing project called “The Jungle” in Marin City, California, Tupac started a rap group with his friend Ray Luv: Strictly Dope. The style of their songs was a mix between socially aware and feel-good, whimysy rhymes, such as ‘Panther Power’ and ‘The Case of the Misplaced Mic’. At this point, Tupac was living with Leila Steinberg, who ran a poetry and music workshop. She did everything in her power to help Tupac in general, and launching his hiphop carreer specifically. It was Steinberg who introduced Tupac to Atron Gregory, N.W.A.’s road manager who also managed Bay Area rap group Digital Underground. Tupac would soon after join them, which was the end of Strictly Dope. 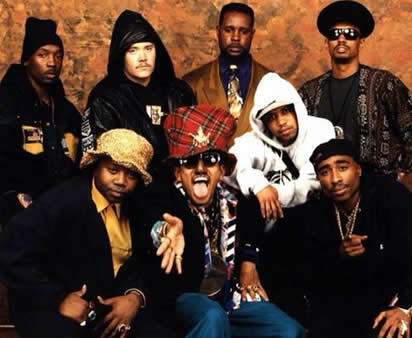 Digital Underground was a comical, yet socially conscious Bay Area rap group founded by Greg “Shock G” Jacobs (also known as Humpty Hump) and Jimi “Chopmaster J” Dright. Tupac joined them in 1990 as a roadie anc backup dancer, but later got his big debut rapping on the group’s ‘Same Song’, which not only appeared on the soundtrack of the 1991 Dan Aykroyd film Nothing but Trouble, but also brought Digital Underground (including Tupac) a cameo appearance in the film. While still a member of the group, Tupac went on to release his first solo album, 2Pacalypse Now (1991). 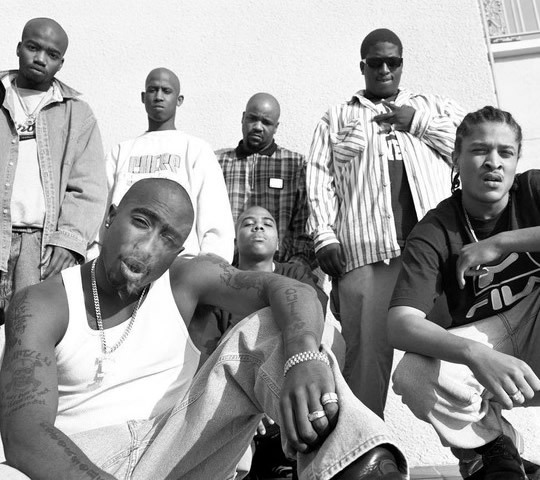 In 1994, Tupac brought together some fellow rappers (his stepbrother Morpeme, Big Syke, Macadoshis, The Rated R and Stretch) in a group called Thug Life. They recorded a whole bunch of songs, resulting in one (heavily edited and toned-down) studio album, Thug Life: Volume 1 and the basis for the posthumous 2Pac release, R U Still Down? [Remember Me] (1997). But Thug Life would be much more than just this group, the iconic tattoo on his belly, or even the Code. It was a whole philosophy, a whole inclusive, cross-gang, cross-neighbourhood movement, representing all people from the streets. This rap trio, also referred to as “Thoro Headz” and “Young Thugz”, consisted of Yafeu “Young Hollywood” Fula, Katari “K-Dog” Cox and Malcolm “Big Mal” Greenridge. 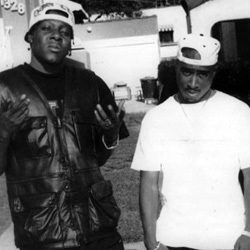 They first appeared on 2Pac’s Me Against the World (1995) and on the One Million Strong-featured song ‘Runnin’’, together with 2Pac, Stretch and The Notorious B.I.G.. Dramacydal would later merge with Thug Life to form the Outlaw Immortalz. Late 1995, after being released from prison and signing for Death Row Records, Tupac merged Thug Life and Dramacydal into a new group, the Outlaw Immortalz. They were featured for the first time on ‘When We Ride’ (All Eyez on Me, 1996) but probably best known for their part on what is often called the best diss track of all time, ‘Hit ’em Up’. They also appeared on some songs on the Makaveli-album. In 1999, they were co-billed on the posthumous 2Pac album Still I Rise. 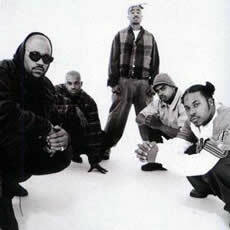 After this album, the Outlawz continued making music and releasing albums, but without too much success.